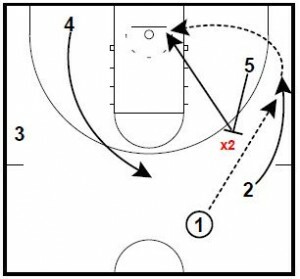 Coach Vonn Read has submitted several plays from his book The Basketball Encyclopedia of Plays to the Coaching Toolbox. Vonn is currently serving as an assistant in the Women’s at Syracuse. He has also served as an assistant coach in the WNBA with the Phoenix Mercury, Orlando Miracle, and San Antonio Silver Stars. He was an advanced scout for the Orlando Magic as well as The Charlotte Sting. This is a simple sideline rear flare set for your best shooter. 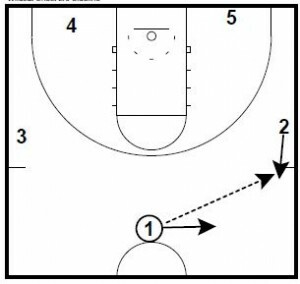 The 1 player will pass the ball to the 2 player stepping up the floor to get the pass. The 2 player will take 1 hard dribble towards the 1 player to make the pass. This gets their defender moving away from the flare screen. The 5 player steps up and gets into position to set the flare screen. After making the pass, the 2 player will flare off the screen for the 3-pointer. This is a blind rear flare screen. 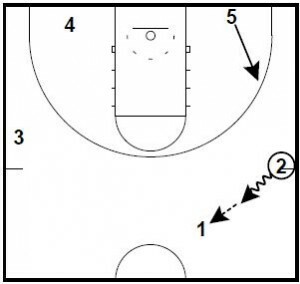 The 5 player will roll to the basket for a layup if X5 helps on the flare. The 4 player flashes high to take away any help on 5 rolling to the basket.